Our 2017 Tour de France cycling holiday itinerary will be confirmed in mid-October, when the route of the 2017 Tour de France is announced. Currently, only Tour Director Christian Prudhomme knows where the Tour will go, but this will all be confirmed on the 17th of October at the Palais de Congres in Paris! We will then time and tailor our 2017 Tour de France cycling tour to provide the best possible holiday experience for you - to see the best stages in the best locations! Our bookings will open shortly thereafter. In 2016 we cycled from Bordeaux to Barcelona and watched the Tour de France in heart of the Pyrenees, where we saw Froome attack on the Col du Peyresourde to take the yellow jersey and then we watched a Stage Start in Vielha, Spain! In 2015 we cycled from Nice to Alpe d'Huez, timing our arrival in the Alps to perfection, where we joined the party atmosphere on Alpe d'Huez to see Nairo Quintana and Froome battle it out for the yellow jersey! Our hotel was superbly located on the mountain itself, where we spent 3 nights amongst the atmosphere and action of the Tour de France! Wide Open Road were on Alpe d'Huez in 2015 to see Nairo Quintana & Christopher Froome battle it out on the 21 hairpin bends! 2016: WOR at the Stage start in Vielha, Spain to see Chris Froome rolling up to the start line! 2015 - we joined the party on the 21 hairpin bends of Alpe d'Huez! Inclusions: All accommodation, daily breakfasts, afternoon teas most days and half the evening meals. Mechanical support, sag wagon, luggage transfer, daily route notes and GPS uploads. Outstanding value: Around half the daily price of other Tour companies! Stages: See highlight mountain stages in the Pyrenees or Alps - we time our holiday to perfection each year! 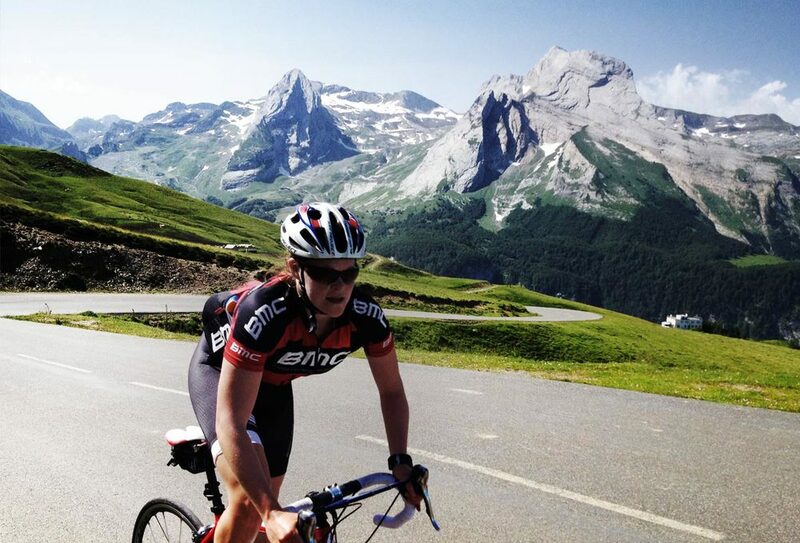 Riding: Ride each day - we don't use buses to transport you - our rides are point to point and we tend to base ourself in the Pyrenees/Alps for 3-4 days so you can see the Tour de France & complete loop rides from our hotel of varying distances (your choice!). Accommodation: We have hotel partners located in the best locations in the Pyrenees and French Alps to ensure you are close to the action and don't have far to ride after watching each stage. We have 12+ years experience running tours to visit the Tour de France, so we ensure you are in the best locations to view the race, understand how road-closures work, sort out the food and cold drinks and organise road-side picnics and BBQs (being Aussies, we always make sure there's always a cold drink on ice)! Fun group atmosphere with like minded cyclists! Visit our Why WOR page for more!